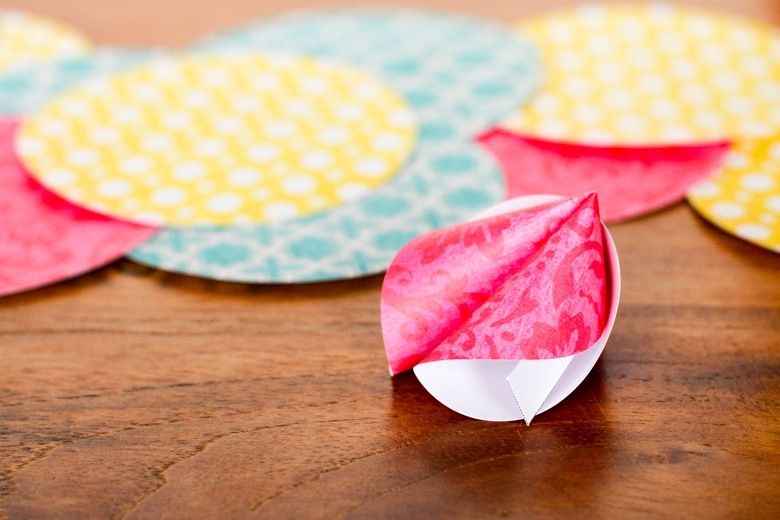 Luckily, origami fortune cookies are really quite easy to make. So even large quantities won’t take long, once you get the folding technique down! PIN IT NOW, MAKE IT LATER! CLICK HERE TO PIN THIS TUTORIAL. And the best part? 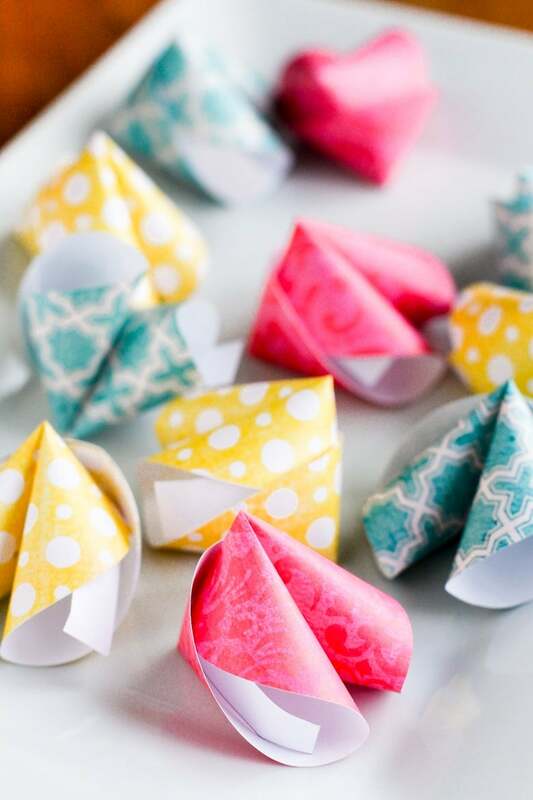 DIY paper fortune cookies are also inexpensive to make. 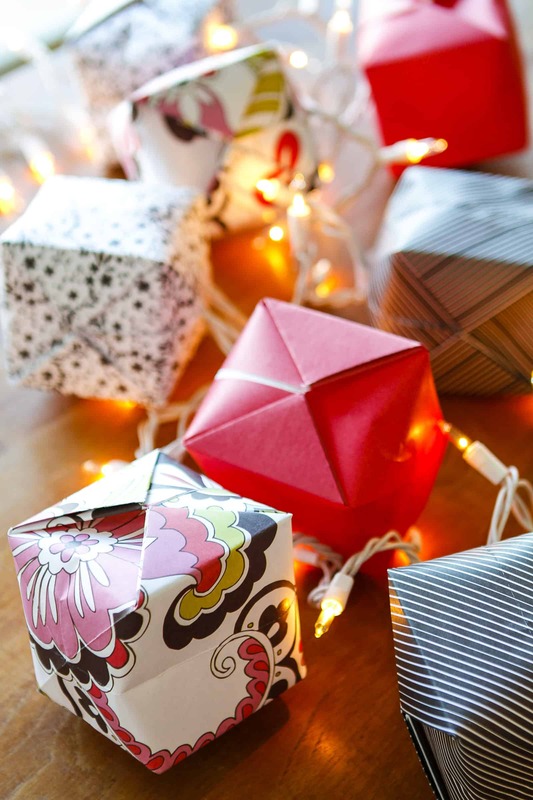 There’s no need to buy special origami paper — in fact, it’s probably too flimsy to hold the fortune cookie shape. Scrapbook paper is sturdier and comes in a huge assortment of colors and patterns at a more than affordable price. Look for an extra sticky double-sided tape or extra sticky glue dots for best results. Okay, folks — this is origami at its easiest! 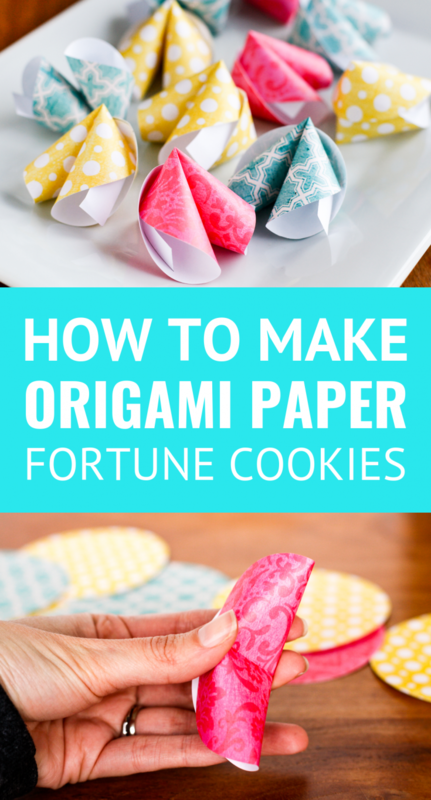 Seriously, anyone can figure out how to make a fortune cookie out of paper… It does require a few steps, but once you make one, you can churn them out like crazy. Even my 8-year-old got in on the action, after a quick demonstration. 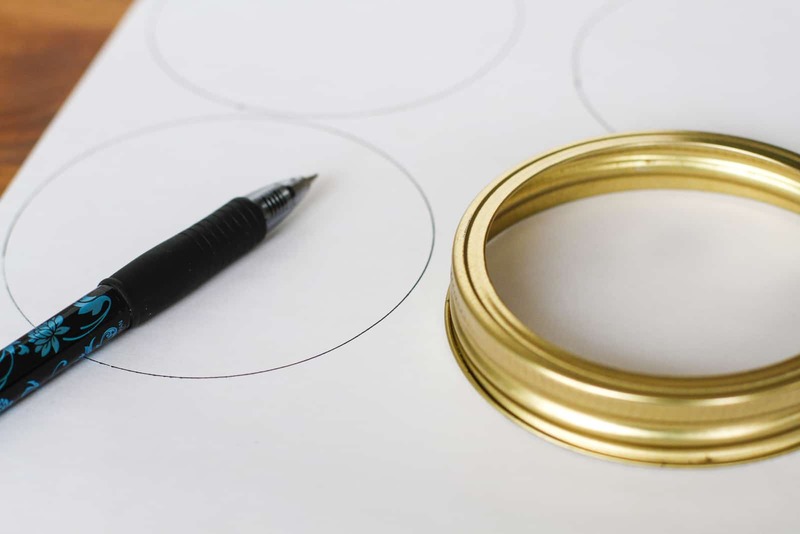 Start by tracing the circles on the back side of the scrapbooking paper, and then carefully cutting them out. You should be able to fit approximately six circles per sheet of paper. TIP: If you have a rotary paper cutter, you could eliminate this step altogether. Just set it to a 3.5″ diameter and start cutting. We want to form a crease on the fold but not across the entire circle. Crease only the center inch or so of the circle as shown here. Open the circle back up, and fold it in half again, this time in the opposite direction from the crease we just made. It’s a little hard to see here, but if you look closely, you’ll see that the crease we just made is running perpendicular to the new fold. Gently push the fold inward with your index finger while using your thumb and middle finger to bring both ends together. 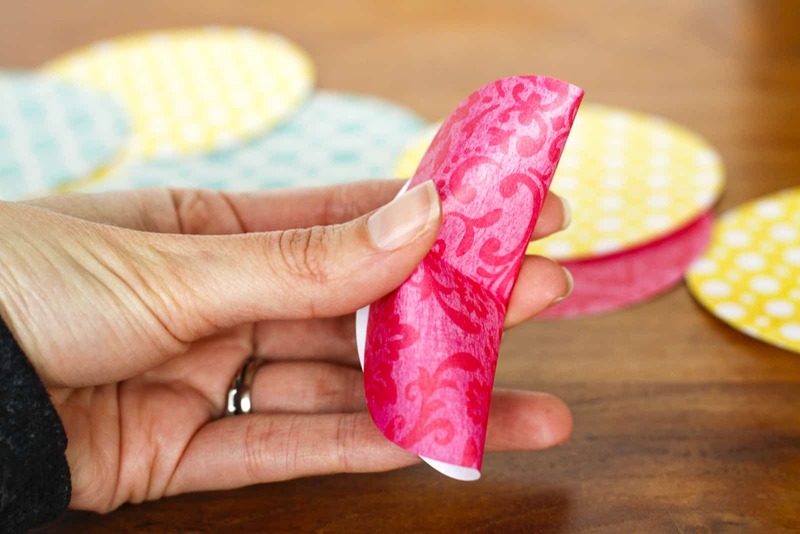 Slip one of the fortunes in the opening on the side before bringing both ends completely together, and use an extra sticky glue dot near the fold to hold the fortune cookie’s shape. Hopefully my photos and instructions are clear enough for you to make these fun little party favors yourself. If you’re struggling, let me know, and I’ll make a quick video to show the folding action! PIN IT NOW! 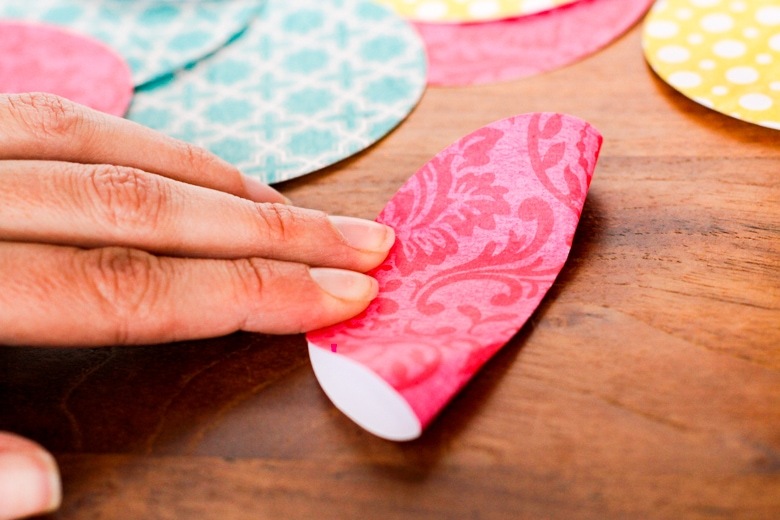 CLICK HERE TO ADD THIS PAPER FORTUNE COOKIES TUTORIAL TO YOUR DIY & CRAFTS BOARD ON PINTEREST! 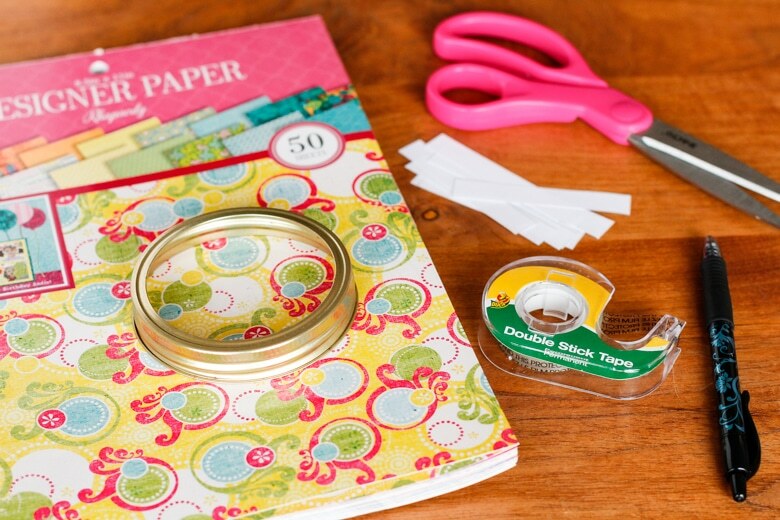 Trace the circles on the back side of the scrapbooking paper, and carefully cut them out. If you have a rotary paper cutter, you can eliminate this step altogether. Just set it to a 3.5″ or so diameter and start cutting. 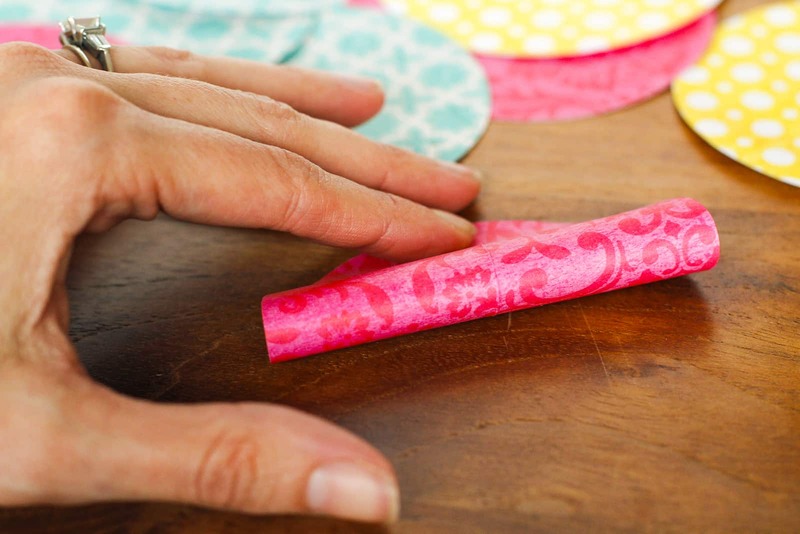 Take one of the cut circles and gently fold it in half. Smooth out a hard crease on just the center inch or so of the fold. Open the circle back up, and fold it in half the opposite way. The small crease you just made should be running perpendicular to the new fold. Gently push the fold inward with your index finger, while using your thumb and middle finger to bring both ends together. Slip a fortune in the opening on one side before bringing both ends completely together. Secure the paper fortune cookie closed with an extra sticky glue dot positioned near the fold. The dimension I give in the instructions make a paper fortune cookie that about the size of a real fortune cookie. But my suggested sizes are just that — suggestions. 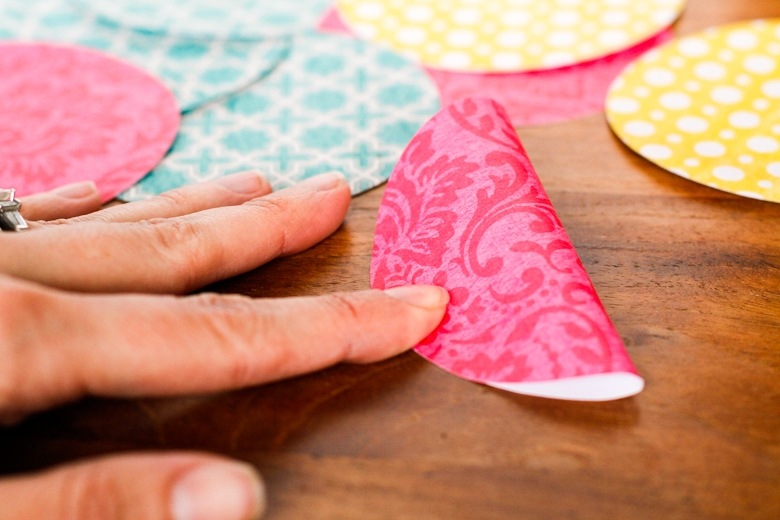 You can totally customize these paper fortune cookies to your heart’s desire. Make them giant, or make them tiny. Include a handwritten fortunes, or print some off. Add glitter or use shiny gold foil scrapbook paper. There are so many possibilities! 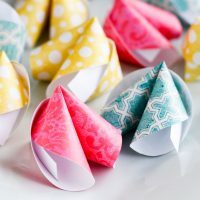 If you love these paper fortune cookies or are just looking for more Chinese New Year crafts for kids, I think you’ll also adore these origami lights! 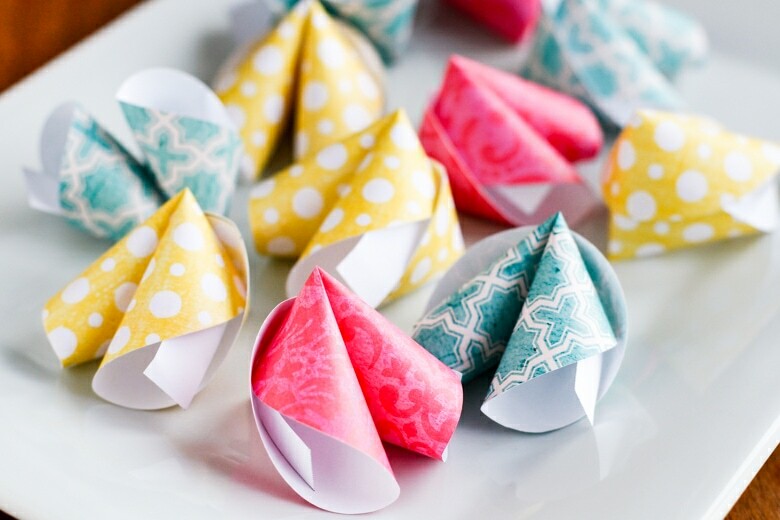 They’re made from simple paper Chinese water bombs (did you make these when you were little?! ), and we used scrapbook paper for them, as well. I’d love to see how your paper fortune cookies turn out… Tag me @Unsophisticook on Instagram or use the hashtag #Unsophisticook so I can check them out. Enjoy! LOVE this idea, Juli — thanks for sharing! hello there, wondered if you would be able to show me a video of how you folded these. I can’t seem to get it right ? thank you so much as i think these fortune cookies are so darn cute and i really want to make them. Hi April! Sure, I won’t be able to get to it today, but I’ll see if I can throw one together tomorrow. I’ll let you know when it’s available! Oh, I hope they love it! I was a Brownie when I was little, and I have such fun memories of the craft projects we used to do. Thanks so much for sharing with your troops, Helen. Thanks, I used these in place of a b-day card for my niece! I put 6 in a clear bag with a ribbon. My daughter made a few for her friend’s b-day, too! Hi Susan! You would position the sticky tape or glue dot inside the fold, near the crease. If you do this and then bring the two ends together, it will be hidden inside the fold. if that’s not ok, please let me know so I can edit or delete my post. Hi Jennifer! Sure, I don’t mind you including them. You may use a photo, but I’d appreciate it if you’d just include a link for them to get the instructions here. Thanks! What fun!! Kids will enjoy making their own fortunes. This would be a great way to pass the time on a long road trip or airplane trip! The kids could make enough for each day of the trip and have fun opening and reading fortunes each morning. LOVE! Visit http://www.theeducationaltourist.com where I write about traveling with the kids.